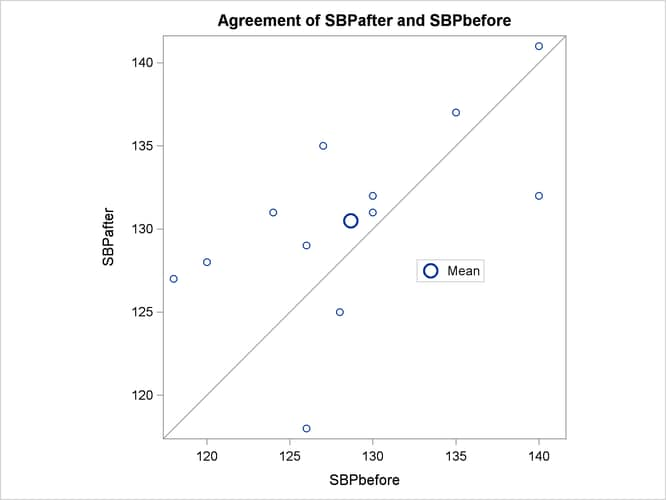 The variables SBPbefore and SBPafter denote the systolic blood pressure before and after the stimulus, respectively. The PAIRED statement is used to test whether the mean change in systolic blood pressure is significantly different from zero. The tabular output is displayed in Output 106.3.1. 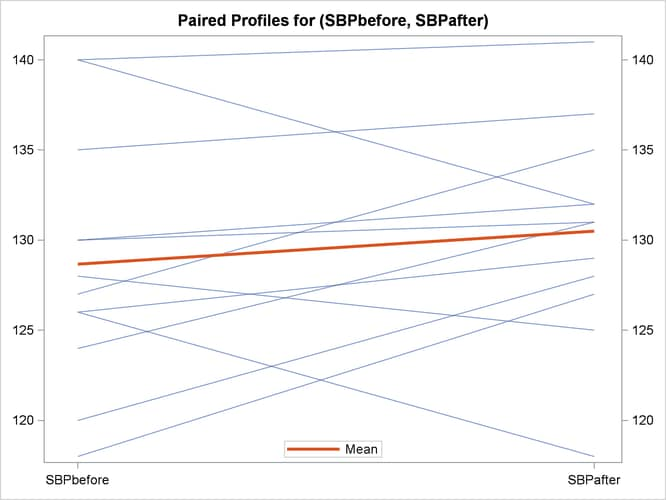 The variables SBPbefore and SBPafter are the paired variables with a sample size of 12. The summary statistics of the difference are displayed (mean, standard deviation, and standard error) along with their confidence limits. The minimum and maximum differences are also displayed. 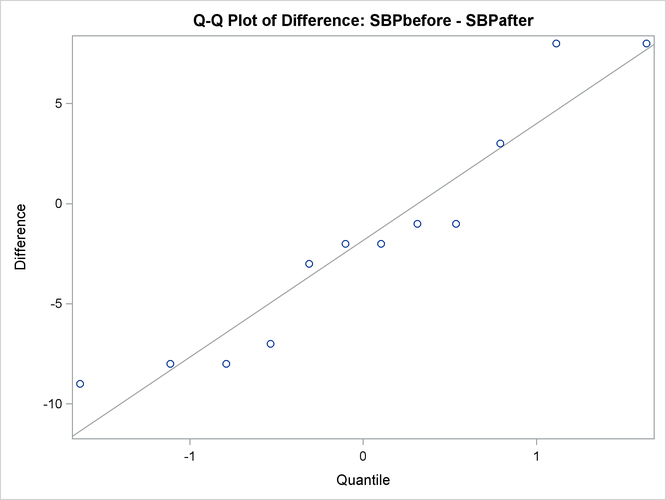 The t test is not significant (t = –1.09, p = 0.2992), indicating that the stimuli did not significantly affect systolic blood pressure. 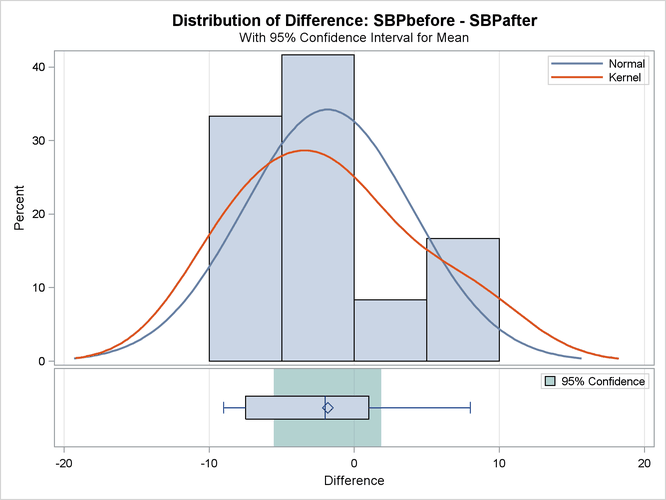 The summary panel in Output 106.3.2 shows a histogram, normal and kernel densities, box plot, and 100(1 – )% = 95% confidence interval of the SBPbefore – SBPafter difference. The agreement plot in Output 106.3.3 reveals that only three men have higher blood pressure before the stimulus than after. But the differences for these men are relatively large, keeping the mean difference only slightly negative. The profiles plot in Output 106.3.4 is a different view of the same information contained in Output 106.3.3, plotting the blood pressure from before to after the stimulus. The Q-Q plot in Output 106.3.5 assesses the normality assumption. The Q-Q plot shows no obvious deviations from normality. You can check the assumption of normality more rigorously by using PROC UNIVARIATE with the NORMAL option.